I work at a screen printing shop and we have a Roland VersaCAMM SP-300v. 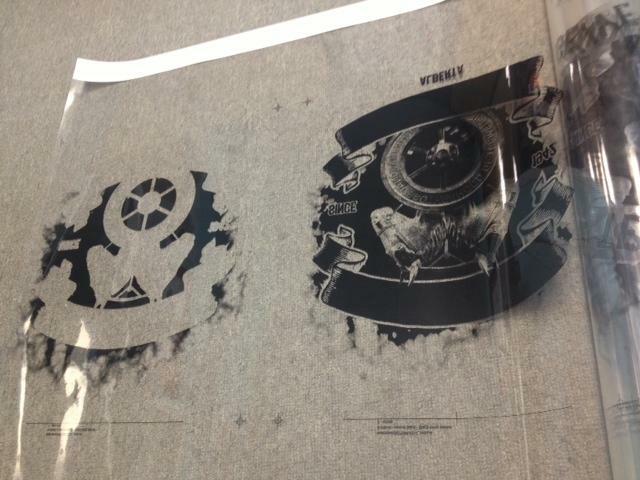 What I'm wondering is can this printer print on clear transparency rolls (I'm not sure if they have a specific name)? We need to be able to print separations that are large format. Anyone out there with any information or experience in this regard? I've attached a picture of what we're basically looking for.. we get someone else to print these, but they have a newer Roland. I print them with both the mutoh and mimaki on occasion when I am out of waterproof paper. Print them right out on laminate. Seems to work well. Done a few halftones with them and also some spot color separations. Some how I don`t see that working. I would think the ink will puddle or just form droplets. Laser printer is what you need. No on the laser printer not used as much nowdays. Inkjet is almost preferred method. The waterproof film positive is coated to accept massive amounts of ink and a good RIP is needed to lay it down nice and thick.